The plot is about a shadowy group called the Crusaders, which has been organizing itself into a power center. Its poster shows a handsome Aryan lad against the waving American flag. Their slogan, "Join The Crusaders -- Fight for America!". The implication is clear...the Crusaders will be against anyone who doesn't look, sound or believe the way that Aryan poster boy does. When a columnist is killed while looking into the Crusaders, Howard Malloy finds himself appointed a special prosecutor. When a magician's act takes precedent over his marriage, his wife gives him trouble. 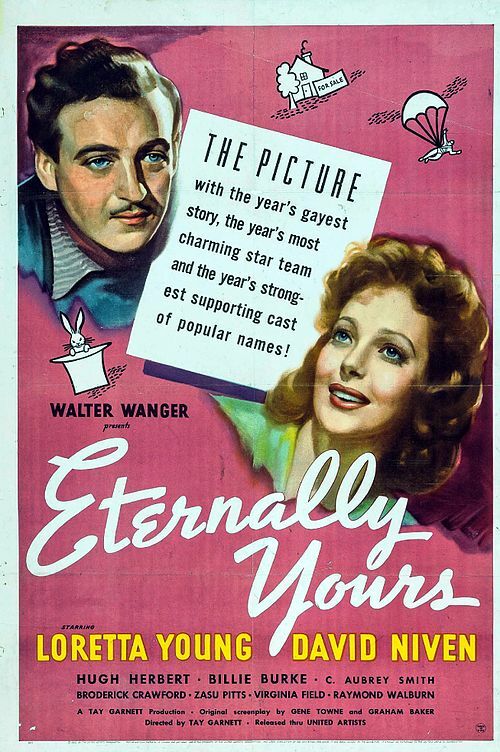 Stars Loretta Young and David Niven. Originally uploaded by kotic There is some cool footage of the Trylon and Perisphere from the 1939-1940 worlds fair. World War II vet Frank Pryor (Lloyd Bridges) returns to London from America after six years to look up an old flame, Pauline French (Moira Lister), now a successful actress. As he and the other passengers deplane and walk across to the terminal, Frank pauses for a moment and asks the man beside him for a light. There's a gunshot and the man crumples to the ground, shot by a marksman with a high-powered rifle, an assassin with a limp. It's not long before Frank Pryor is up to his neck in murderous intrigue. From:IMDb: France, 1640: Cyrano, the charismatic swordsman-poet with the absurd nose, hopelessly loves the beauteous Roxane; she, in turn, confesses to Cyrano her love for the handsome but tongue-tied Christian. The chivalrous Cyrano sets up with Christian an innocent deception, with tragic results. Much cut from the play, but dialogue not rewritten.